If one has aspirations towards a football writing career, what better way to start than to write a story close to home – a story about a team that you are a part of. The following is a tale about our church soccer team, who joined a regional league this year and went on, not only to finish 3rd in the regular season, but also to make the final after winning their playoff semi. In a year without a major tournament (World Cup, Euros etc), the month of July is often a very long month for the average football fan. Most major leagues across the world are on their off-season breaks and most football followers suffer from what is called ‘Football Withdrawal Syndrome’. So when news filtered in that our church, Westville Baptist Church (WBC), could be joining a Sunday League involving church youth groups in the Durban area, this news was received with much excitement. This version of a social Sunday soccer league involves 12 churches (previously had 8) around Durban – teams featuring mainly youth (Under 21) and some young adults (21 – 35). Thanks to the generosity of Gelofte Primary School in Pinetown, who allowed us to use their 2 football grounds, most matches (95 % of them) were played at the school ground. 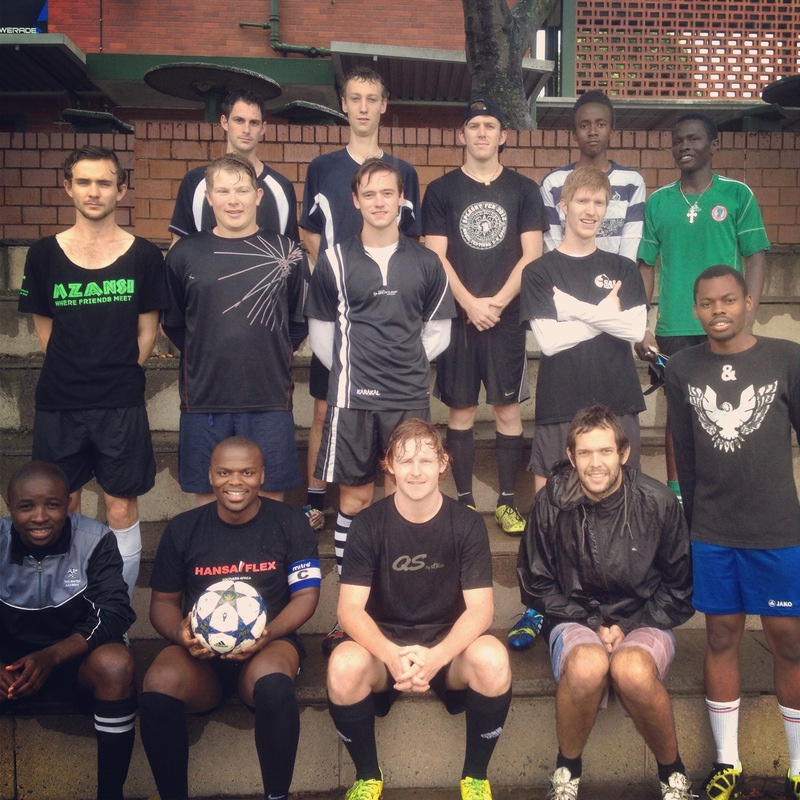 With 12 pm and 2 pm kickoffs, the league was designed not to clash with Sunday services, but also to allow friends and parents an afternoon of fun and fellowship in the Durban sun. Teams were limited to play 7 games max, one of the reasons being to avoid clashing with exams in November. For WBC, the journey began against Glenridge on the 28th of July. In a tightly contested game, Glenridge took the lead in the first half but Bryce equalized in the second. However, a late long range shot from Glenridge bounced awkwardly in front of our goalie and won them the match. We responded well to that setback & comfortably won the next game against Highway Church (Fusion) 4-1, with most goals coming in the second half – Warren and Bryce among the scorers. We were showing early signs of improvement, but a 3 week break from the league- where we had no scheduled fixtures and somehow led us to lose momentum. The third game of the season was always going to be a tough test, as we faced His Church – a team that had a 100 percent record in the league, having won their first two games. Later in the season, His Church would go on to finish 2nd in the regular season – losing out on top spot by goal difference. But we fared well here – again a shot from range early in the first half (with a suspected deflection) caught our goalie (Anthony) off guard and that proved to be the difference, His Church winning 1-0. At this stage, with 3 points from a possible 9, WBC were languishing in 8th place on the log, just 3 points above bottom placed Fusion. The next game would be crucial. Against Sarepta, it was a game of two halves. Sarepta came out of the blocks at full speed, racing to a 2 goal lead inside the first half hour and we were left staring at a 3rd defeat in 4 games. But we picked ourselves up as we fought back from a poor start to level matters. Ambu pulled a goal back on the stroke of half time and then we scored another goal midway through the second half. Though we couldn’t get the 3rd goal to win the match, our confidence was restored and this showed in the remainder of the season, as we went on a magical run of unbeaten games and clean sheets. THE UNBEATEN RUN – Invincibles! We thumped Hillcrest Methodist 6-0 on the 22nd of September, with a couple of guys getting on the score sheet, including Josh, Byron and Marc. The following week, we won 8 – 0 (another clean sheet for the likes of Craig, Vuyile, Tyron & Jarrod) with a hat-trick from Shawn and also goals from Jimmy, Byron & Tom. At this stage, we were on 10 points, fourth in the league and with (what had earlier seemed like) an unlikely shout for a play-off spot (top 4 teams). The final league game against Olive Tree was like a final before the final for us, as only a win would be enough to take us through to the top 4. This was the best performance by the team. Yet another tight game, as the first half ended goalless, though we had created many opportunities. We did not give up and late in the game, Shawn scored a great team goal that took 3 moves from the back. Centre back Lee found Josh on the edge of the box with a precise long range pass. Josh turned and slid in a Ozil-type through pass to Shawn who had made a great run behind their defence, and in turn he made no mistake, beating the keeper from close range. Olive Tree tried to fight back, but a combination of good saves, rugged defending and fortune kept them at bay as WBC won the game 1-0. Other results meant WBC finished 3rd on the final league table, booking a place in the semis against His Church (who we had lost to earlier in the season). THE PLAYOFFS – Close but no cigar! The playoff semis were played on the 20th of October. While Kloof Harvest cruised to victory in their match, WBC and His Church were engaged in another tense game. The final score of 0-0 led to a penalty shootout – Rob was the hero with 2 penalty saves. From one win in 4 games in the first half of the season, we had gone on a great run of 4 undefeated games, 4 clean sheets and a 15-0 aggregate score to make it to the final in our 1st season in the league. However, the fairy-tale came to an end as the boys seemed to run out of steam. Kloof Harvest, defending champions who had also topped the league in the regular season, beat us 1-0 in the final in a rainy, muddy final on 27 October. The match was marred by a broken leg suffered by one of our strikers, Jimmy, following an unfortunate incident when going for the ball. In the end, 2nd place out of 12 in our first season tells its own story – we lost in the final, but came out with our heads held high. We also got a chance to be involved with other churches (some churches I never even knew existed) and hopefully, that will be the start of more fellowship among churches in the future. But for us at Westville Baptist, the challenge next season is simple – to go a step further, and win the tournament. Die Mannschaft – The WBC squad before the final.